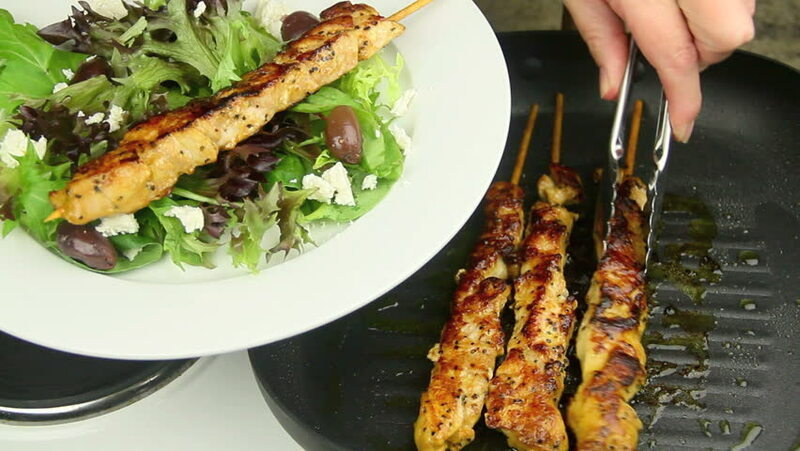 Grilled chicken kabobs being served from a griddle pan with tongs on to a plate with salad. hd00:13A woman decorates a turkey dish with vegetables, slices of red tomato and soy sauce in a sauce bowl. hd00:10Traditional middle eastern food, shawarma with garnish. Picture of traditional Eastern warm sandwich with garnish. Oriental cuisine, shawarma, doner kebab. hd00:22Cutlets from chicken liver in sesame, laid out on a pumpkin salad. Hands spread cheese balls. Close-up, studio light. hd00:28Man Eating Traditional Breakfast with Sausages, Fried Eggs, Vegetables and Orange Juice.